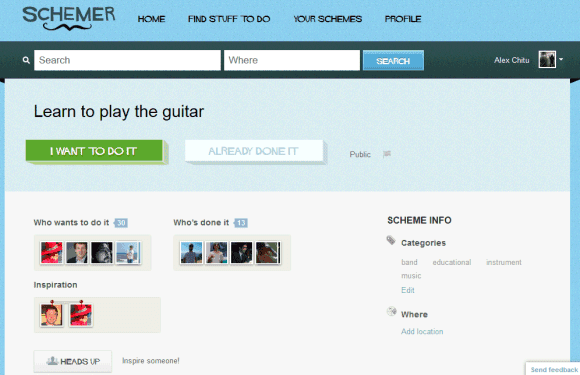 Schemer is an invite-only Google service for sharing and discovering things to do. "A scheme is any activity that can be done in the world, whether it's ordering a favorite dish at a restaurant or snorkeling in the Caribbean with sharks," explains Google. Much like 43 Things, Schemer lets you define goals and mark the things you've already accomplished. You can inspire other people, find people who have the same goals and join the conversation. To make it easier to find a scheme, you can add tags and locations. Google also partnered with Bravo, Food Network, Rolling Stone, IGN and Entertainment Weekly, so you can get ideas from experts, not just from your friends. "Whether it's exploring a new city, checking out a friend's movie recommendation, or just finding new activities for your weekends, Schemer lets you discover new things to do, share schemes with friends, and make the most of your day," mentions Schemer's team. The service is integrated with Google+ and you need to join Google+ to be able to use it. "Schemer uses your profile picture and name from your Google+ account to identify you as a schemer user. This means that when you post a scheme, write a comment, post a reply, or indicate either you want to do or have done a scheme, your profile picture and name will be attached to those activities." Schemer is actually a Google+ app and it's likely that you'll be able to use it inside Google+ in the future. 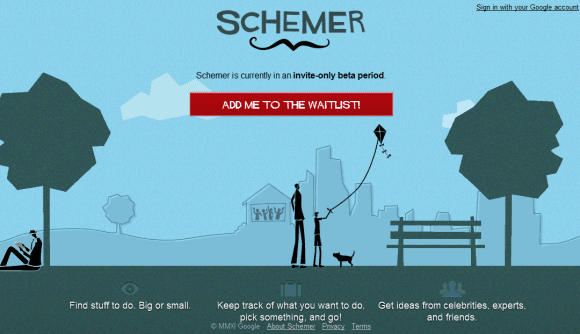 Google also promises to launch a mobile app for Schemer so you can find schemes related to your location. Now that Google+ no longer requires invitation, Schemer could make Google+ more popular. There's a great viral video, an interesting design and a site that doesn't look like a regular Google service. A scheme is "a secret or devious plan" (American Heritage Dictionary) and a schemer is a person who is involved in making these secret plans, so Google uses a mustache logo, a mesmerizing animated homepage, the Hitchcock font and catchy messages like "You're looking diabolical!" or "Invite your partners in crime". Note: this post includes another invitation link. The first 20 people who can find it will get access to Schemer, but each one can invite other 20 people. Update: you can find more invitations using Google Search and Twitter Search.